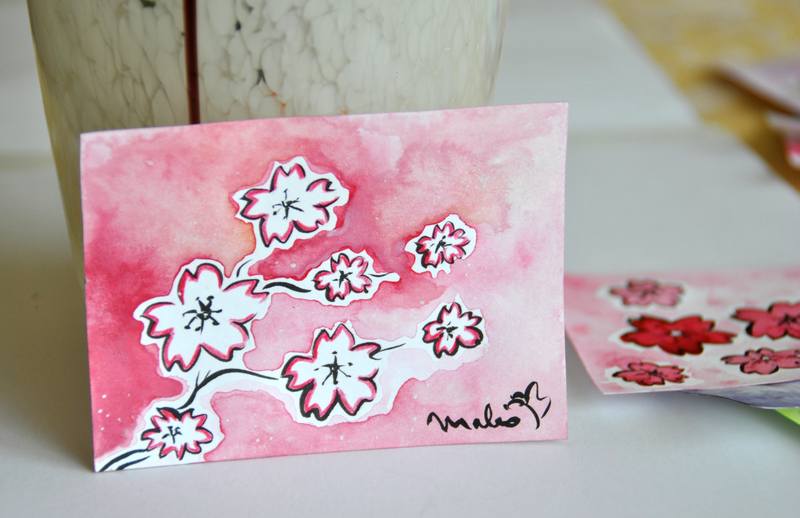 I have never heard about ACEO or ATC before I was introduced to it and that’s a shame! This is basically about small cards with original paintings you can trade with other people! I have never traded cards or anything besides my Sailor Moon and Pokemon stickers back then in my elementary school… But it is so much fan! I’m working on 2 ATCs for Windowfog right now and I’m so excited to trade them with her!! It is really relaxing and you can experiment with different techniques and colours, get to know each other! These are my first cards I’ve made. I only took pictures from those 3 cards but I will show you all of them later! 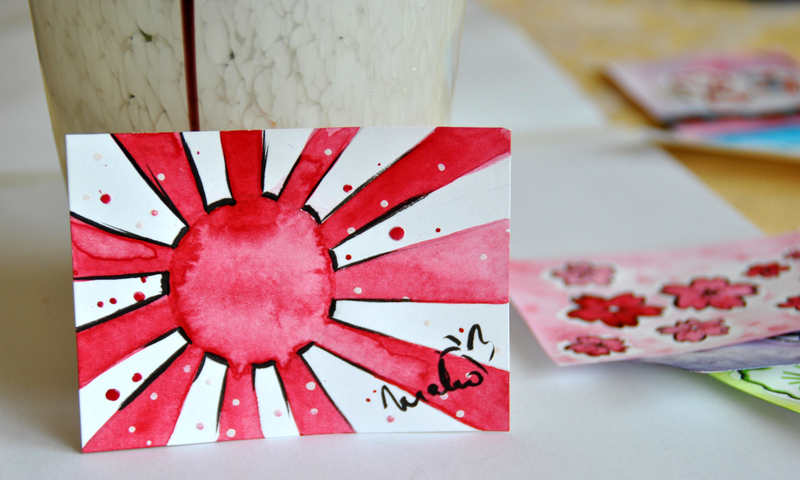 On of my biggest dreams is to visit Japan and since this flag is on my pin-board I was inspired to paint it! Cherry Blossomssss! There is nothing more beautiful than cherry trees! 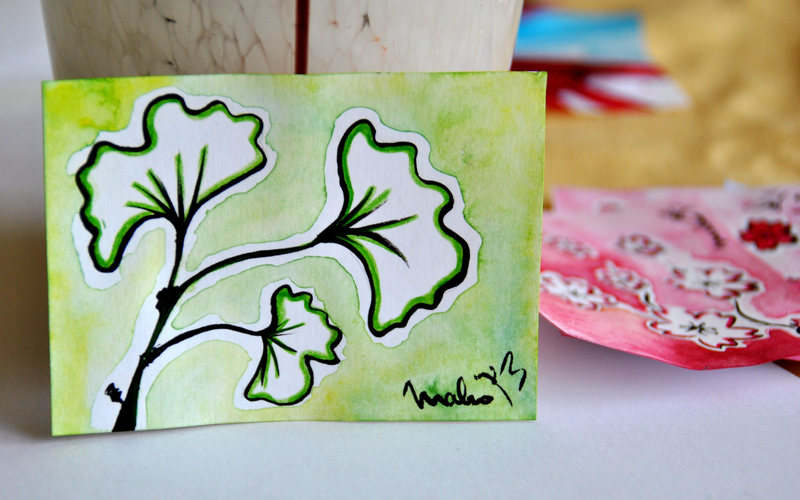 Ginkgo leaves! I would love to have a Ginkgo tree in my garden.. I had a visitor when I took the pictures! Let me introduce you to my mother’s cat Alice! I someone wants to trade with me, feel free to contact me! XD Bwaha, that cat looks so not amused! I really like how you did the selective outlining with the black on the top card, btw. No! 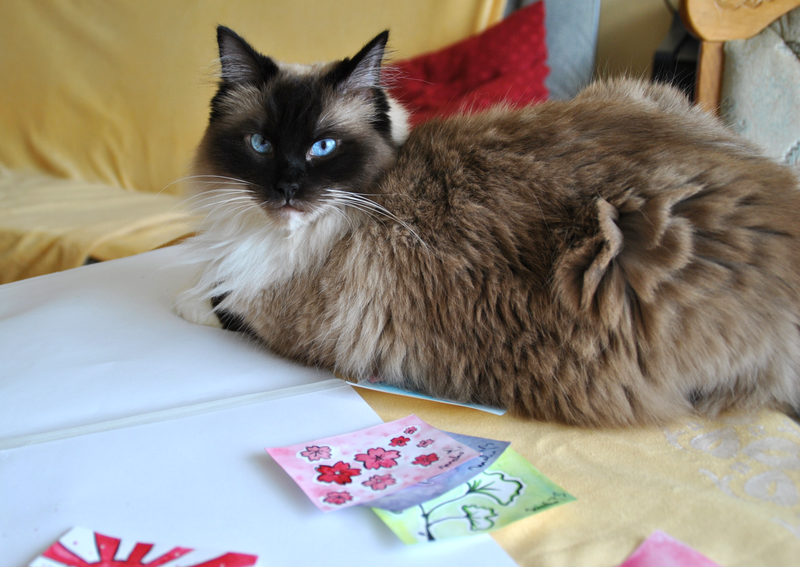 What was she thinking interrupting me in my srs bsns….. And what does she doing on the table anyway! And thank you! I wanted to experiment with my brush-pen I bought years ago… I really forgot how fun it is to paint with him!